Muriatic acid; Spirit of salts. 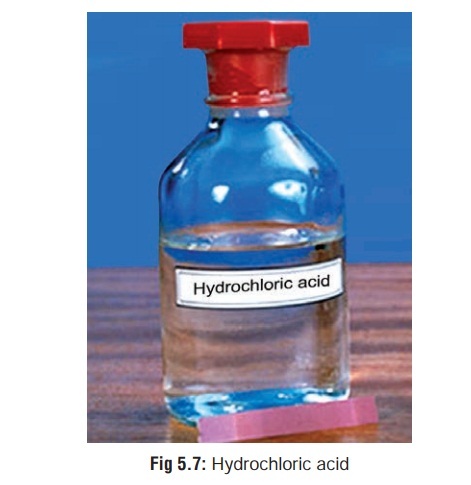 Hydrochloric acid is a colourless, fuming liquid which may acquire a yellowish tinge on exposure to air (Fig 5.7). It is actually hydrogen chloride in water. About 30 to 40 ml. If an open bottle of concentrate ammonia solution is placed near the stomach contents or vomitus, copious white fumes of ammonium chloride will emanate. Though normal stomach contents contain hydrochloric acid, this is usually too dilute (0.2 to 0.5%) to vitiate the value of this test. The rest of the information on HCl is practically the same as for H 2SO4, except that corroded areas are more likely to be greyish, and symptoms are generally less severe. But respira-tory manifestations are more pronounced.